As part of my ongoing efforts to procrastinate, I spent a fair part of my day yesterday trying to research whether there was a dupe for Chanel's June nailpolish, released as part of their spring 2012 collection. 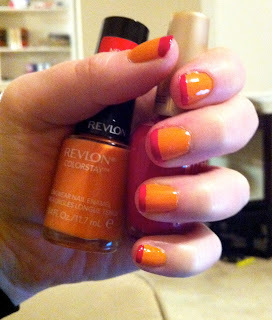 Much to my surprise, there weren't many suggestions as to possible dupes but one that was suggested was Revlon's Sorbet. So today I popped into my local CVS to see if Sorbet was a match! It looked more orange in the bottle than the swatches I've seen of June, but it was a gorgeous color nonetheless so I snapped it up! I decided to do a modern take on a french tip by pairing Sorbet with Milani's Cherry Pie, a gorgeous hot pink. I'm not terribly dexterous, so my left hand always comes out better than my right and adding the colored tip always takes longer and requires more patience.....but I am really pleased with how fresh and spring-y these nails make me feel, so it was all totally worth it! I don't have Chanel's June myself to compare Sorbet to, but Sorbet is definitely a lot more orange, and less peach, than June. But it is a very wearable shade and isn't too bright and neon as to make it garish!